Previous chapters have discussed G-force acceleration times of various durations. EXAMPLE-1: 100 days of G-force enables a cruise velocity of about 25%c. EXAMPLE-2: After considerable performance enhancement, a vessel might be able to maintain G-force propulsion for an entire year to achieve a cruise velocity of about 65%c. (NOTE: Let this scenario be considered the "Standard" Time Dilation to AC.) Thought Experiment (TE) assumes that inherent fuel limitations would not enable a vessel to G-force propel for much longer than one year. EXAMPLE-3: HOWEVER, interstellar snowballs (huge spheres of ice sent to refuel star bound ships) might enable an interstellar vessel to G-force for as long as 712 days to enable a cruise velocity of 86.7%c. At such a speed, relativistic time dilation would cause an on vessel observer to measure time at half the rate as an Earth bound observer. 1) G-force for a sec. Near Earth's surface, let a material object free fall for one second, and it will gain a velocity of about 10 m/sec (actually 9.8065 m/s). Let it continue free fall for a 2nd and 3rd second, and velocity will become about 20 m/s and 30 m/s respectively. Velocity will increase an additional 10 m/s for every added second of free fall. One day has 86,400 seconds (= 24 hours/day × 60 min/hr × 60 sec/min). If a vessel can g-force accelerate for an entire day, it will achieve a very high velocity of 847,281.6 m/sec (= 86,400 sec × 9.8065 m/sec). This velocity can be conveniently converted into other equivalent values. Daily Difference (Δ). After one day of g-force propulsion, vessel achieves a small portion of light speed. Thought Experiment (TE) calls this percentage the daily difference. Phase 1. Accelerate for 712 days at g-force. This achieves a high cruise speed to shorten flight duration and also simulates gravity for contents and occupants. Since g-force comes from particle flow leaving aft of vessel, occupants feel a gravity like force likely from decks (axial planes intersecting the longitudinal axis). Thus, "up" is toward forward end of vessel which is pointing toward AC, our destination. as the gigantic portion of light speed not yet achieved after one day of g-force. Einstein tells us in his Special Theory of Relativity that light speed (c=299,792.458 k/s) is fixed regardless of observer's speed. Thus, Earth observer and vessel observer both observe c as same value even though Earth observes continuously, increasing velocity of g-force vessel. TE reconciles this paradox via following exponential which calculates vessel velocities to ever approach c but never attain it. In this example of an interstellar profile, g-force vessel accelerates for 712 days to achieve a cruise velocity of VCru = 86.7%c. To conserve fuel, vessel then terminates propulsion and maintains earth like gravity via centrifugal force by spinning vessel about its longitudinal axis at carefully planned angular velocity. During the cruise phase, the vessel makes excellent time due to its relativistic speed (86.67%c = 259,818.131 km/sec); however, the g-force vessel must slow down (to a few km/sec) to approach and orbit objects in Alpha Centauri system. Thus, TE envisions vessel again powering the G-force propulsion system to reverse the propulsion vector; thus, the high energy exhaust particles would flow in the direction of flight to cause a decelerating effect. It's axiomatic that decelerating at g-force should take same time/distance as accelerating at g-force. Since the first year of g-force acceleration took 1.11 LY, the voyage's final year would consist of g-force deceleration for the same distance. Since we assume an interstellar vessel travels at constant relativistic speed during the cruise portion of flight, it is a straight forward procedure to simply calculate time dilation during cruise portion of voyage. Previous chapters provide procedures for determining distance during G-force accelerations. Cruise Time can be easily expressed as both normal time as well as relativistic. for each LY of cruise distance. for each year observed by Earth. However, cruise is only part of the interstellar flight, and time dilation also happens during acceleration and deceleration phases. Computing time dilation for g-force acceleration more difficult because such velocity is ever increasing. Thus, TE uses following technique to approximate time dilation for each day of acceleration. Determine Spot Velocities. To determine spot velocities for end of each travel day (which TE also assumes as the initial spot velocity for next travel day), TE uses following formula as previously described. Determine Daily Average. To determine average velocity for each acceleration day, TE determines mid velocity. Next, TE converts this average from AU/day to decimal light speed (c), designated as dc. 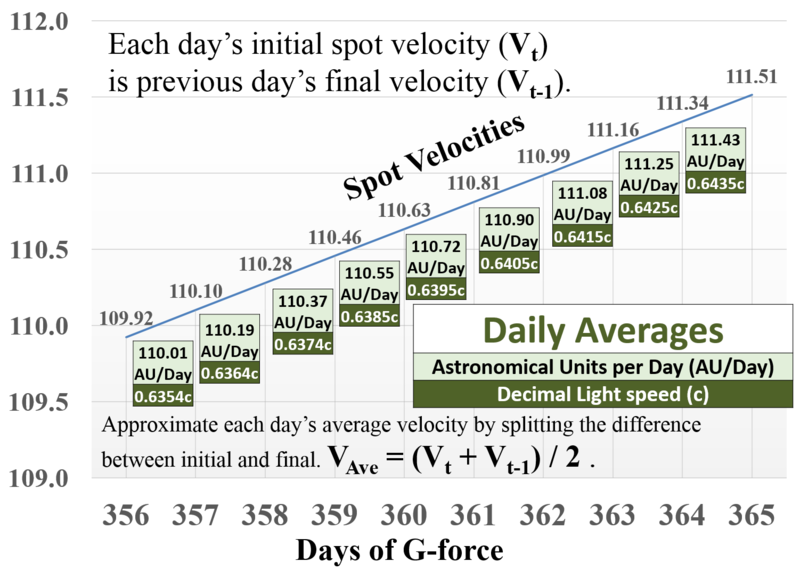 Convert vessel velocities from decimal light speed to/from AU/day with conversion constant: c = 173.145 AU/day. 8) Time Dilation During Acceleration Since TE assumes that acceleration duration equals deceleration duration, TE further assumes that corresponding time dilations are also equal. Determine Daily Dilation. 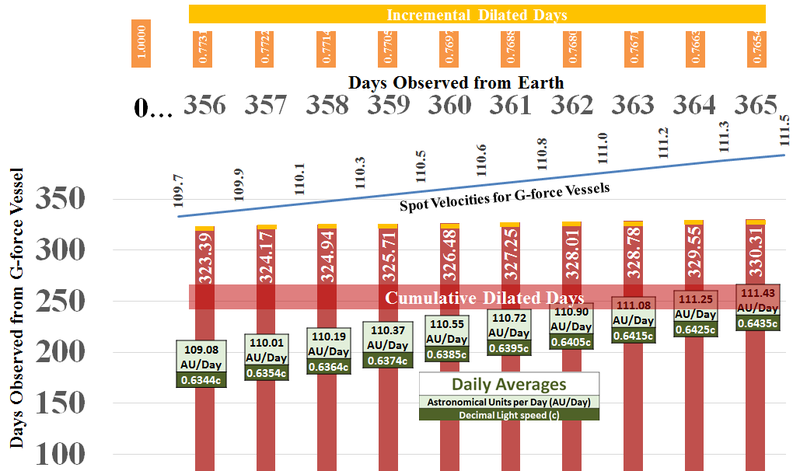 Following diagram shows daily dilations after 365 days of g-force. Of course, we assume that interstellar vessel can even accelerate well beyond 365 days as fuel permits. For total time dilation (tr-Ttl), consider relativistic time shrinkage during all three phases of interstellar voyage: g-force acceleration, cruise, and g-force deceleration. for 86.6%c for 1.11 LY. for 2.16 LY cruise distance. EXAMPLE: G-force journey to the Alpha Centauri system.